10 of 50 bulbs has already gone out the long-term test. The picture was taken in the laboratory Nemko this week. Compact fluorescent lamps from Osram Luxram and have poor life in long-term test. 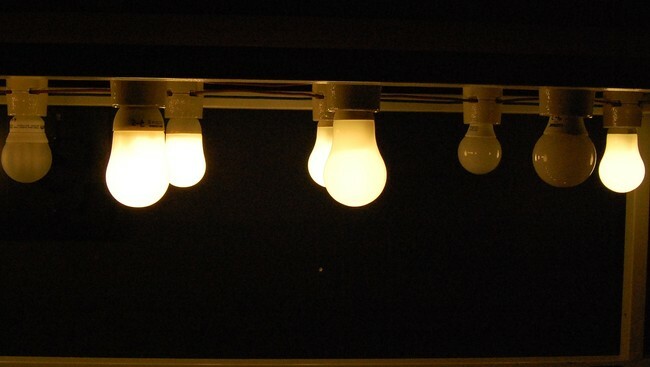 Every fifth bulb has gone out after only half of the specified lifetime. Bulbs from Luxram and Osram had especially poor performance in NRK test. At the request of NRK Consumer Inspectors, Nemko tested the life of ten different bulbs. Five copies of each lamp were tested. Now this long-term test has been going on for 5200 hours, which equates to almost five years in consumption if the bulbs are turned on for 2.7 hours each day. 10 of the 50 CFL bulbs have already packed it in, even though most of them are claimed last for 10,000 hours or more, according to information on the packages. Five of the bulbs had gone out after only 2500 hours. In Nemko laboratory the bulbs are turned on and off at regular intervals, according to the international test standard. The result so far allows two lamps stand out as very durable. 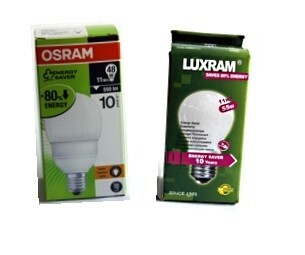 All five Luxram bulbs (11 W Energy Saver) has now gone out. All Luxram bulbs and three Osram bulbs have gone out at mid-term. Moreover, three of the five bulbs from Osram (Duluxstar Mini Ball) have called it a night. Approx price for these two bulbs were respectively 29 and 80 kroner, and both have a specified life of 10,000 hours. One of five bulbs from Energetic (Energy Saver Warm White Bulb Classic) and one lamp of the North Light model from Clas Ohlson has gone out. Although life is so-so, the Osram lamp became test winner as Nemko and NRK tested other qualities of a half ago. The Osram bulb had good efficacy after both 100 and 1000 hours, and it starts quickly. Osram is admittedly more expensive than many of the others, but uses the least power in return. Read more about the test here. – We regret the outcome of course, but are surprised by the result, says CEO Arvid Furru in Osram AS. He questions the fact that only five bulbs of each brand tested. – If they originated from a batch that had a weakness, it may be an explanation for life. In Europe, selling tens of millions Osram series without errors each year, says Furru to NRK.no. 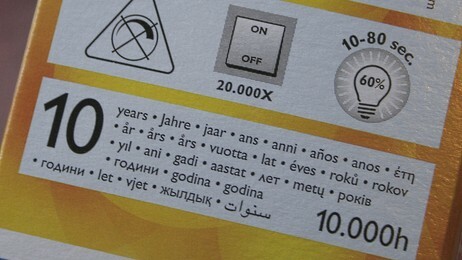 He adds that Osram bulbs have three years warranty in Norway. – Customers may experience problems of this type, you switch to a new bulb by contacting us or the store where it was purchased, he said. – Luxram doing so badly is not surprising at all. Early in the test, it became clear that these bulbs have poor light output, which is further reduced after 1000 hours. And one of the five Luxram bulbs went out after only 1160 hours, said Erlend Lillelien, head of the knowledge center [national lighting industry representative] Lyskultur. He is more surprised Osram results. – The manufacturer is known for good quality, and these bulbs came out best in the remaining portion of the test. I hope the explanation for poor life is that Osram bulbs stems from a bad batch. – But the test is realistic in the sense that all the bulbs are picked straight off the shelves, says Lillelien to NRK.no. He believes many consumers get the wrong impression when labels informs about a ‘life of 10,000 hours.’ – The internationally agreed definition of life is that half of the savings bulbs continue to burn after the 10,000 hours. It is not possible to produce bulbs with a guarantee that all last that long. 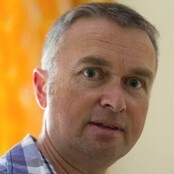 – Therefore, the information on the packaging to be rather confusing for the public, says Erlend Lillelien. Already in May, three of five Luxram bulbs burned out. CEO Frode Eng at Lampe magazine, which sells Luxram bulbs, admitted then that result is too bad. He, too, was surprised at the poor life, even if he thought it’s a bit unfair to compare the 29-kroner bulbs with others that cost far more. – But of course we are unhappy with the result. Life indicated on the package of course should be valid, said Eng NRK.no the last time we summarized the test results. Now all Luxram bulbs in the test have burned out. The test is still in progress. CFLi have an effect equivalent of between 48 and 60 watts compared with the old incandescent bulbs. 1. Isn’t it funny that when tests reveal CFL bulbs to not last as long as claimed, the lighting industry representative “hopes” that it was due to “a bad batch”. How about a bad product? 2. And then the representative goes on to state: “The internationally agreed definition of life is that half of the savings bulbs continue to burn after the 10,000 hours. It is not possible to produce bulbs with a guarantee that all last that long. Therefore, the information on the packaging to be rather confusing for the public”. 3. And the Luxram retailer thinks the test is unfair? While it does follow a certain logic that cheaper lamps can’t be expected to have the same quality as top brand bulbs, how is it unfair to expect a lamp to last as long as it says on the package? Especially when long life is one of its two major selling points? 4. Interesting also how the article author feels compelled to point out that the Osram lamp still made Best in Test on other qualities. Such as quick startup time and good brightness both after 100 and 1000 hours. I’m not at all surprised by these results. The CFL bulb models tend to lose more light and have shorter life than bare tube models due to being enclosed in that outer bulb, trapping heat which affects both life and brightness. And while the very thin diffusing layer on the inside of a frosted incandescent bulb has virtually no effect whatsoever on its light flow, adding another frosted bulb over the already semi opaque tubes has a marked light diminishing effect in CFLs. It is simply a product which should never have been made, since there are already other lamps that do the same job so much much better. One of the most common complaints from disgruntled customers is premature failure after only a few hours, days, weeks or years, way short of the life rate stated on the package; sometimes due to poor lamp quality, sometimes from using good lamps in the wrong luminaires so they overheat, or switching them on-and-off too often. In real scenarios, what causes CFLs to fall short of their rated life? As anyone who frequently replaces CFLs in closets or hallways has likely discovered, rapid cycling can prematurely kill a CFL. Repeatedly starting the lamp shortens its life, Snyder explains, because high voltage at start-up sends the lamp’s mercury ions hurtling toward the starting electrode, which can destroy the electrode’s coating over time. Snyder suggests consumers keep this in mind when deciding where to use a compact fluorescent. The Lighting Research Center has published a worksheet [PDF] for consumers to better understand how frequent switching reduces a lamp’s lifetime. The sheet provides a series of multipliers so that consumers can better predict a bulb’s longevity. The multipliers range from 1.5 (for bulbs left on for at least 12 hours) to 0.4 (for bulbs turned off after 15 minutes). Despite any lifetime reduction, Snyder says consumers should still turn off lights not needed for more than a few minutes. Another CFL slayer is temperature. “Incandescents thrive on heat,” Baker says. “The hotter they get, the more light you get out of them. But a CFL is very temperature sensitive.” He notes that “recessed cans”—insulated lighting fixtures—prove a particularly nasty compact fluorescent death trap, especially when attached to dimmers, which can also shorten the electronic ballast’s life. He says consumers often install CFLs meant for table or floor lamps inside these fixtures, instead of lamps specially designed for higher temperatures, as indicated on their packages. Among other things, these high temperatures can destroy the lamps’ electrolytic capacitors—the main reason, he says, that CFLs fail when overheated. Are Compact Fluorescent Lightbulbs Really Cheaper Over Time? A study published in 1998 examined CFL performance with five different operating cycles. It found that when the length of time the lamps were on was reduced from 3 hours to 1 hour, the lamp lasted for 80 percent of its rated life. When reduced to 15 min and 5 min, the lamp lasted for 30 percent and 15 percent, respectively, of its rated life. Regularly flicking a bulb on for a brief moment and then off again is not recommended as it can shorten the lifetime of the bulb. When CFLs fail prematurely, calculated long-term savings of course go down the drain. As noted in this New York Times article: Do New Bulbs Save Energy if They Don’t Work? Bulb makers and promoters say the overall quality of today’s compact fluorescents is high. But they also concede that it is difficult to prevent some problem bulbs from slipping through. Experts say the quality problems are compounded by poor package instructions. Using the bulbs incorrectly, such as by screwing low-end bulbs into fixtures where heat is prone to build up, can greatly shorten their lives. According to the few consumer tests that test CFLs for that long, life span seems to have improved over the last decade for the best lamps, though not all CFLs work as long as promised. And this is when tested in lab conditions with bulbs burning openly without shades, at optimal temperature etc. In home luminaires with insufficient air flow and real life situations, e.g. when turned on and off often, life rate may turn out to be significantly shorter. Lamp life: Quite a few burned out long before stated life. Of the Osram ‘Miniball’ 11W (marked 6 000 h), all had gone out by half that time! And of a less known brand, North Light (marked 10 000 h), 40 % had gone out by 6 000 hours. Bulb models were least durable while spiral models gave most light and lasted longest. Improvements seem to have been made in the amount of on-off cycles top brand CFLs can withstand, but when I mailed and asked, it turned out that on-off cycles were: 2 hours 45 minutes on, 15 minutes off, meaning that not even this Swedish consumer agency wants to test more frequent switching than that.